India’s largest mobile services operator, two of the largest pharmaceutical companies, a top-tier IT services firm and the second largest tower infrastructure company have chosen the buyback route to return cash to shareholders this year. This is the first time so many large companies have announced buybacks in quick succession; fiscal year 2016-17 looks set to break all prior records with regards to share repurchases. Along with three large buybacks by government-owned companies, Indian companies have announced buybacks worth over ₹ 2,1000 crore so far this year. Of course, it will be a while before buybacks topple dividends as the preferred means to return cash. According to data collated by Mint Research, S&P BSE 100 companies alone paid dividends worth ₹ 1.51 trillion in FY16. (See bit.ly/29xe7dk). In the same period, the amount spent on buybacks by all listed companies was only ₹ 1,800 crore. But this may well be the beginning of a trend where buybacks are used nearly as much, if not more, as dividends to return cash. Research by Credit Suisse shows that in the US, S&P 500 companies spent $572 billion on buybacks in 2015, or 1.5 times of what they spent on dividends. For a number of shareholders, buybacks trump dividends both in terms of tax efficiency and the flexibility they offer. 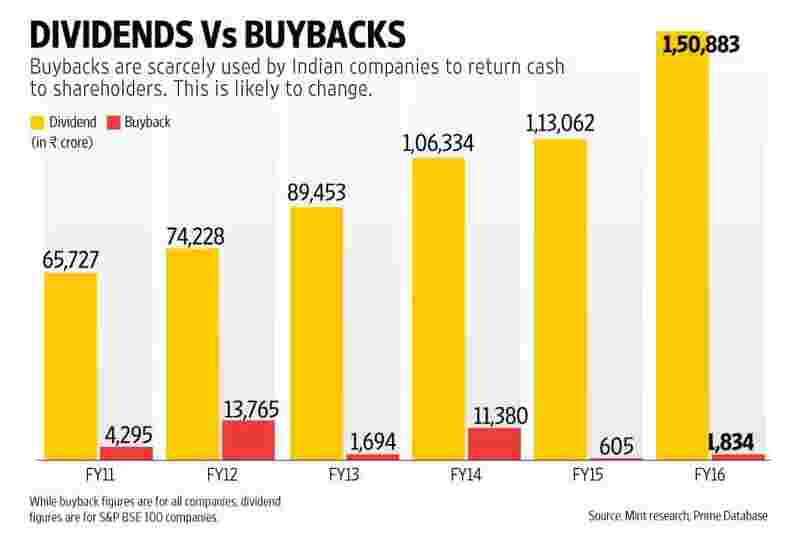 Ironically, in India, the government seems to have overplayed its hand and magnified the relative advantages of buybacks. In the 2016-17 Union budget, finance minister Arun Jaitley introduced an additional tax of 10% on any dividend income of more than ₹ 10 lakh. Dividend distribution tax already amounted to 20.4% of payouts. For stocks that have been held for over a year, the buyback route entails a tax outgo of only 0.1%, which is essentially the securities transaction tax (STT) applicable for the transaction. Since 1 July 2015, Securities and Exchange Board of India (Sebi) has allowed listed companies to make tender buyback offers through stock exchanges. For such transactions, long-term capital gains tax is exempt. Earlier, when companies weren’t allowed to make tender buyback offers through stock exchanges, investors would end up paying a 10% long-term capital gains tax. To be sure, buybacks through tender offers have picked up since FY16. For high dividend earners, the tax savings through a buyback issue are substantial. Bharti Airtel Ltd holds a 71.7% stake in Bharti Infratel Ltd. The latter has announced a buyback of ₹ 2,000 crore. If the promoter tenders shares in proportion to its shareholding, it will take home more than ₹ 1,400 crore after accounting for STT and other costs. If Infratel had chosen the dividend route instead, the net take home would be only around ₹ 1,000 crore. There is likely to be increasing pressure from shareholders to shift to buybacks, given the tax efficiency. One likely pushback is that Sebi imposes a restriction on companies buying back shares—i.e. that they can’t issue fresh equity for a period after the buyback. From a shareholder’s perspective, buybacks offer the flexibility of foregoing the payout by the company and staying fully invested with the company. They can do this by simply opting to not tender shares in the buyback. With dividends, there is no such option. Of course, one can always use dividend proceeds to buy additional shares, although academic studies show that reinvestment is typically rare and forms a fraction of all dividends received. Another peculiarity about buybacks is that while all shareholders are treated the same with dividends, the pricing of the buyback determines which category of shareholders benefit. Michael J. Mauboussin and Dan Callahan of Credit Suisse point out in a note titled Disbursing Cash to Shareholders, “Buybacks benefit ongoing shareholders when management buys stock that is undervalued and benefit outgoing shareholders when the stock is overvalued. Since management should focus on building value per share for continuing shareholders, it should always try to buy back shares that are undervalued." This shouldn’t normally matter in a tender offer, where investors can participate in the same proportion as their shareholding. Even so, empirical evidence shows that some shareholders fail to participate, even when they are incentivized by a substantial premium. Needless to say, investors need to keep a close eye on the pricing of the offer; but companies, too, would do well to avoid buybacks by paying a large premium. The writer does not own shares in the above-mentioned companies.